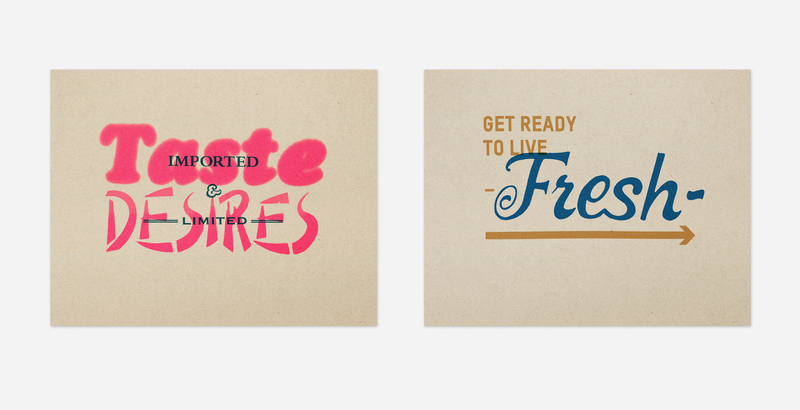 In addition to client work, we also initiate our own projects to cultivate our creative growth while shaping the places we call home. 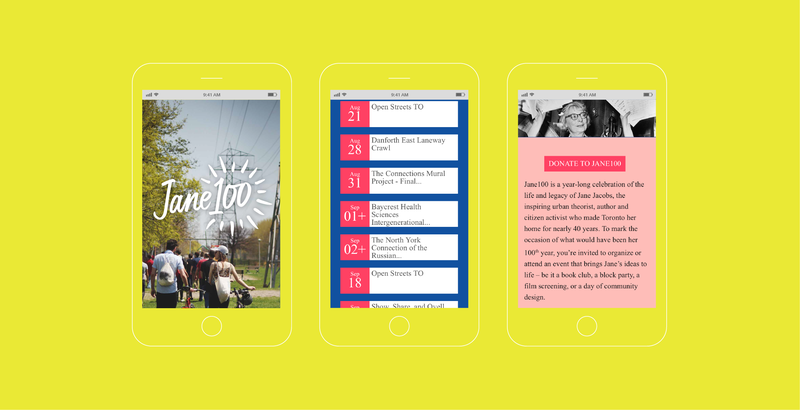 Jane100 was a year-long celebration of the life and legacy of Jane Jacobs, the inspiring urban theorist, author and citizen activist who made Toronto her home for nearly 40 years. To mark the occasion of what would have been her 100th year, RallyRally and other members of the organizing committee invited the public to organize and a end events that engage citizens in dialogue, action and the spirit of Jane – be it a book club, a block party, a film screening, or a day of community design. 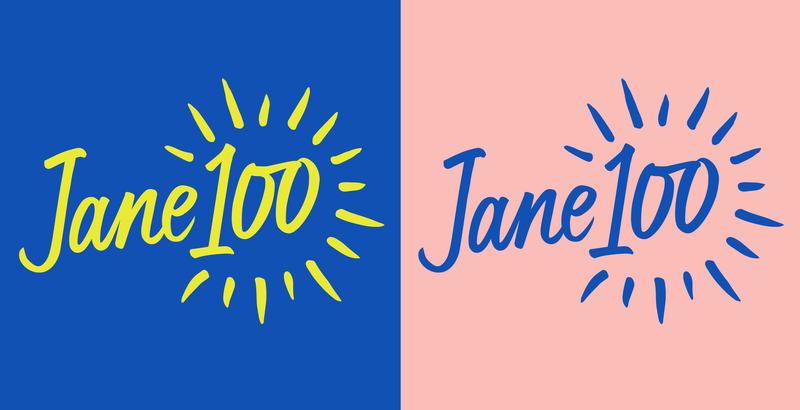 We developed the Jane100 identity, combining an expressive sunburst with a custom handlettered wordmark which includes a subtle reference to Jane’s signature eyeglasses. 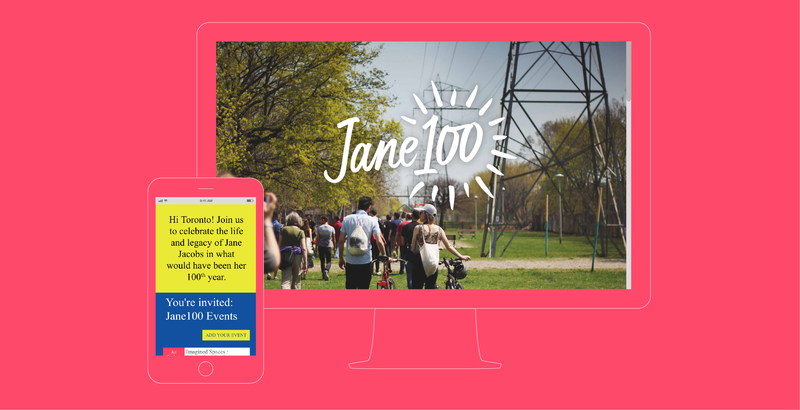 We also designed the website with a celebratory colour palette and images of community activities suggesting the many possibilities of Jane100. 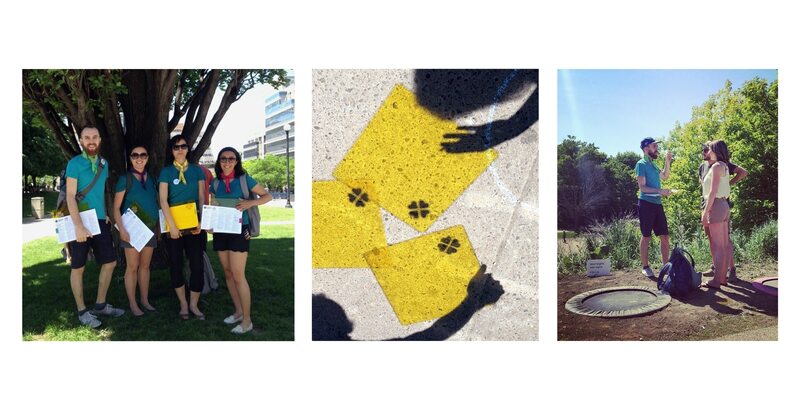 The platform fuelled a year of powerful dialogue and action. 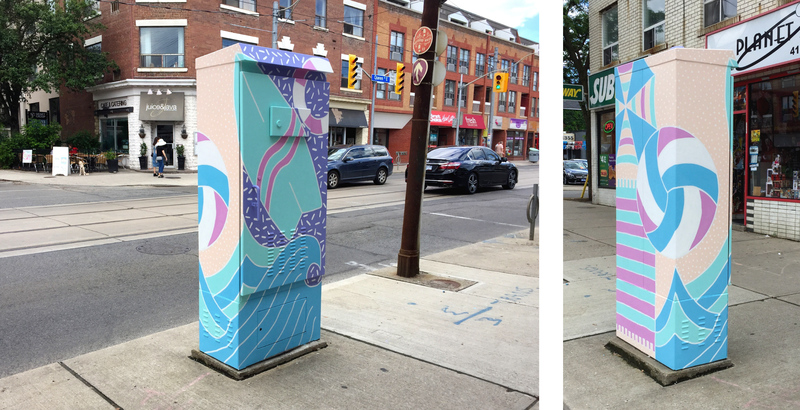 We painted this traffic signal box as part of StreetARToronto’s Outside the Box program in 2017. 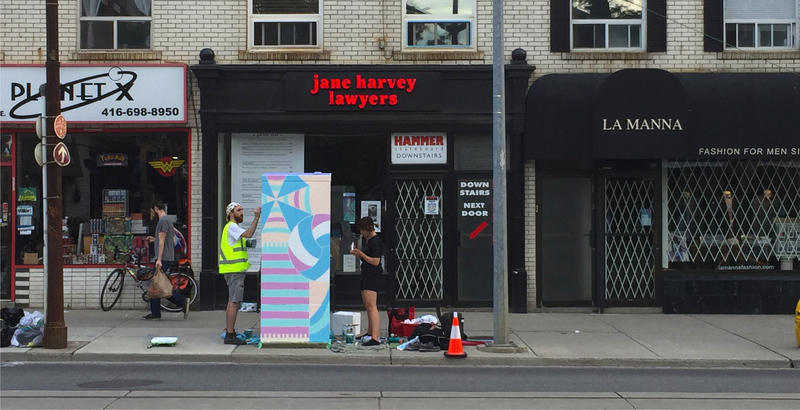 The art serves as a beacon to connect Queen Street East to the nearby beach, celebrating the Beaches’ year-round fun, from beach volleyball and sand castles in summertime to surfing and Winter Stations in the winter. 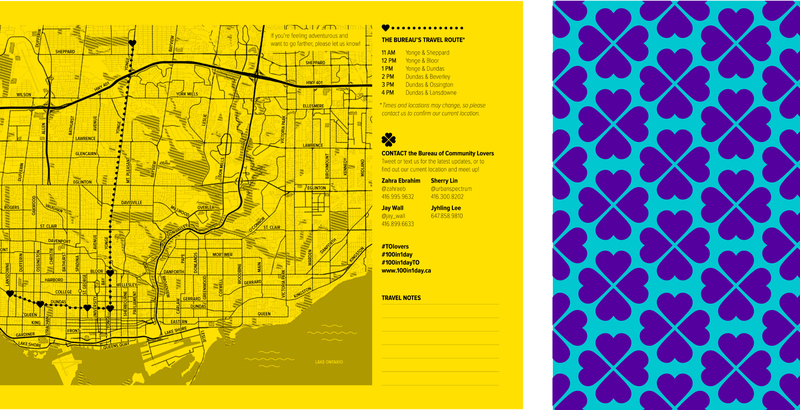 In a rapidly changing neighbourhood, how does the past meet the future? 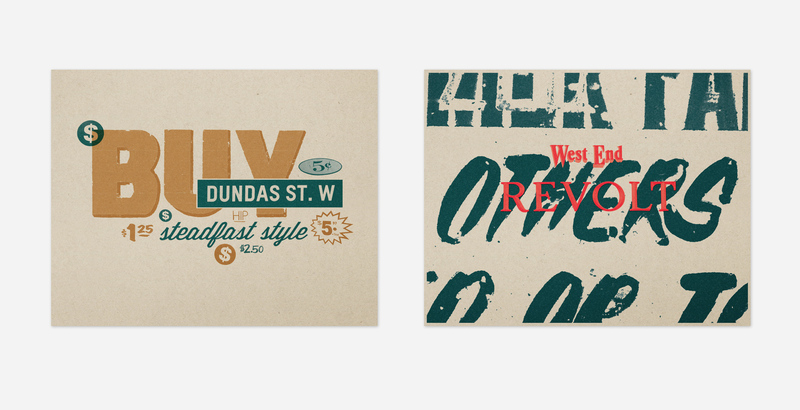 We examined the typographic landscape of the Junction, a historically working class neighbourhood in Toronto’s West End that’s becoming gentrified. 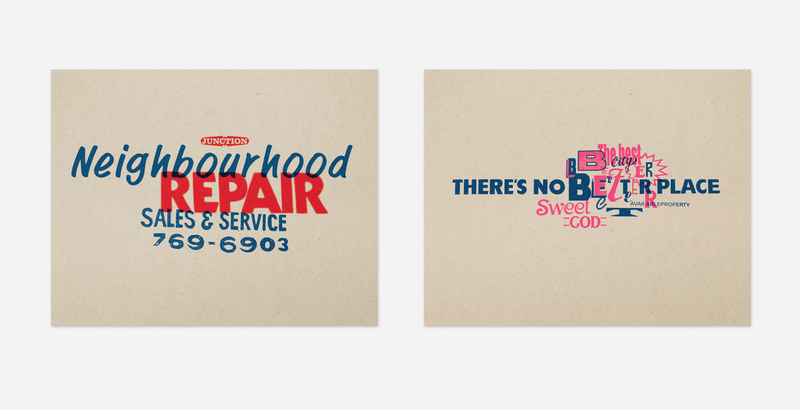 We photographed the storefront signage on local streets, then re-composed the typography and lettering into a poster series presenting a visual commentary on urban change with statements such as “Neighbourhood Repair” and “Imported Taste.” The posters were exhibited in a local restaurant, alongside a black and white collage documenting the current signage of the area from A to Z. 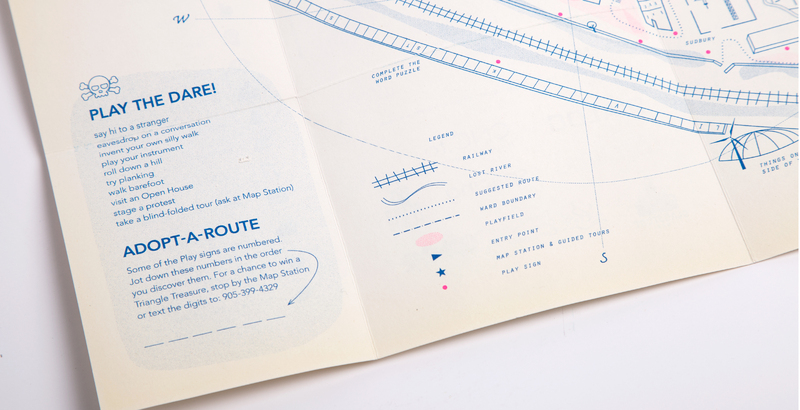 The exhibit looked at how the old and new co-exist – what stays and what gets left behind – and sparked conversations with local residents and newcomers about hopes for the Junction’s future. 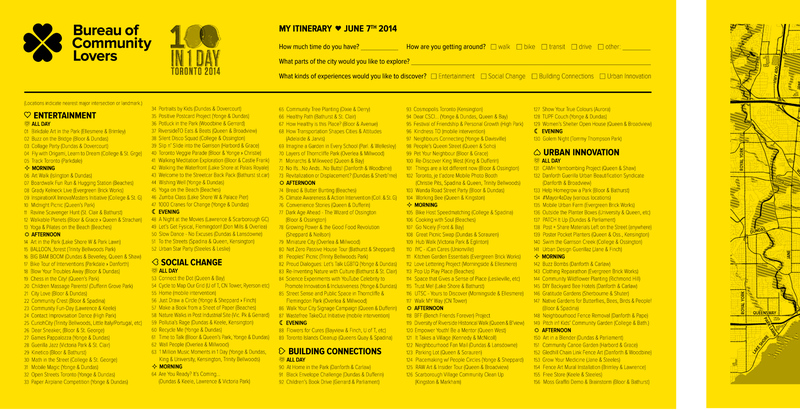 100 in 1 Day Toronto is a citizen-driven festival uniting people across the city through creative acts of urban change. 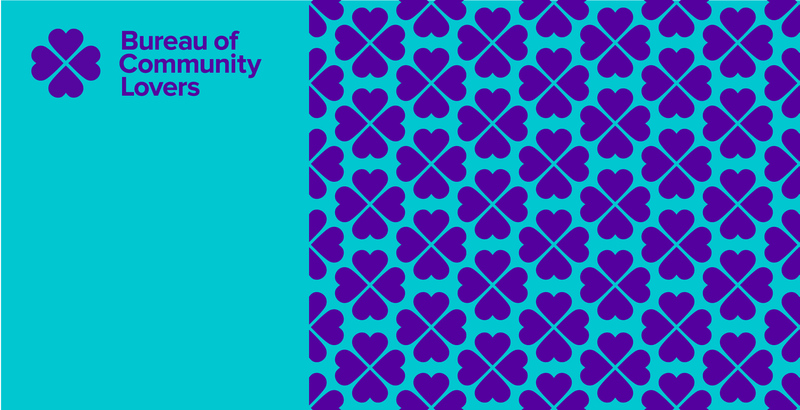 To help people navigate the day and experience the urban interventions, we created the Bureau of Community Lovers – a mobile, public consultation/travel agency that popped up all over the city. 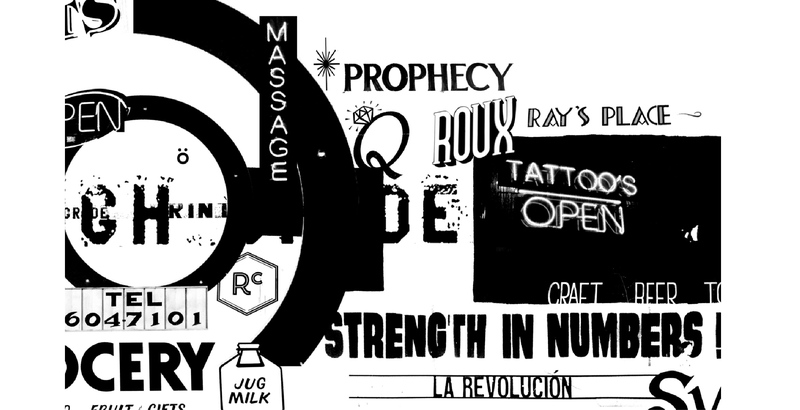 Our brightly uniformed agents prepared custom itineraries based on each person’s unique interests, time availability, and mode of transportation. 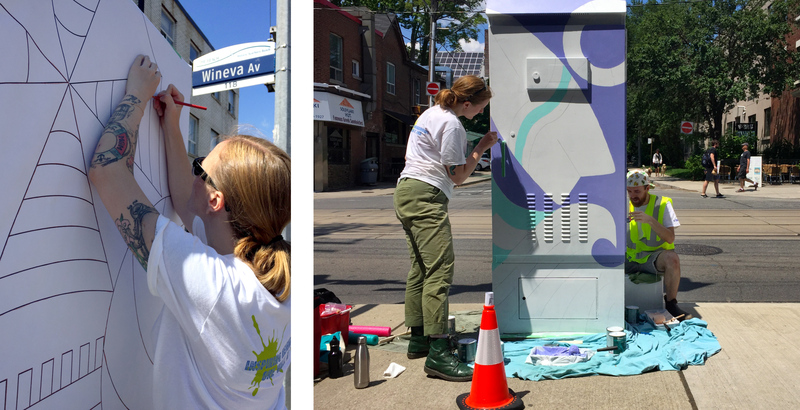 We aspire to help citizens, residents, visitors to Toronto, and curious urbanites discover and engage with projects that use creative measures to engage the public in city-building, urbanism, design, and community development. Playwalk is the practice of exploring the city for no other purpose than play. 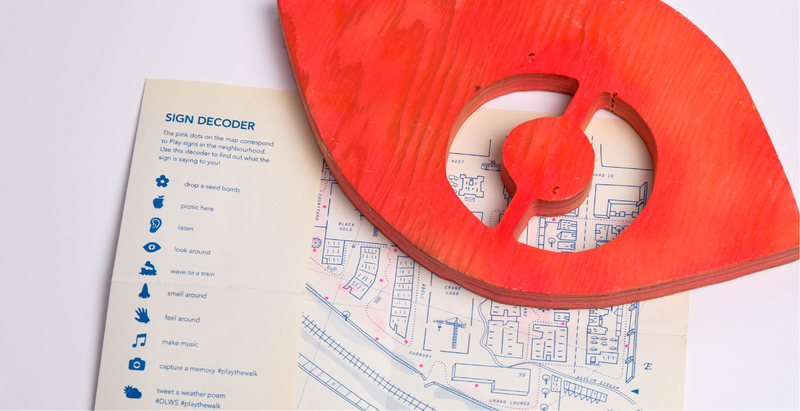 Through this practice developed in collaboration with an architect and a sound artist, we invite you to use your senses to discover the nooks and crannies of the city. Listen to birds in the trees, feel the texture of brick walls, watch the shadows changing form on the sidewalk, and slowly overcome the intangible boundaries of what is possible in the city. 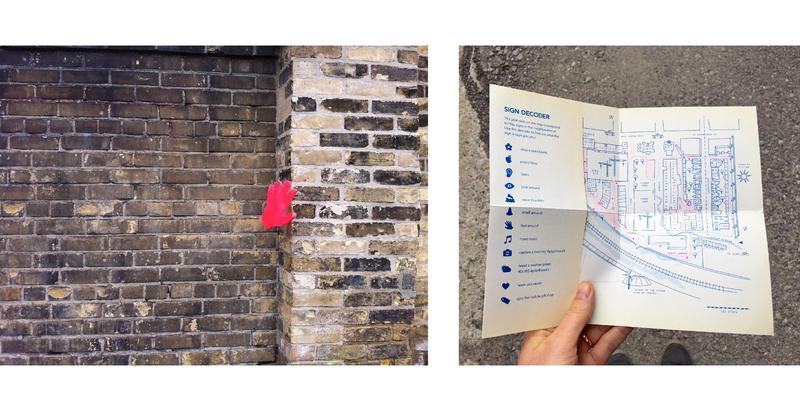 We began Playwalk as a site-specific walk in Toronto’s West Queen West neighbourhood, complete with a hand-drawn map and pink signs encouraging sensory interaction with the cityscape. 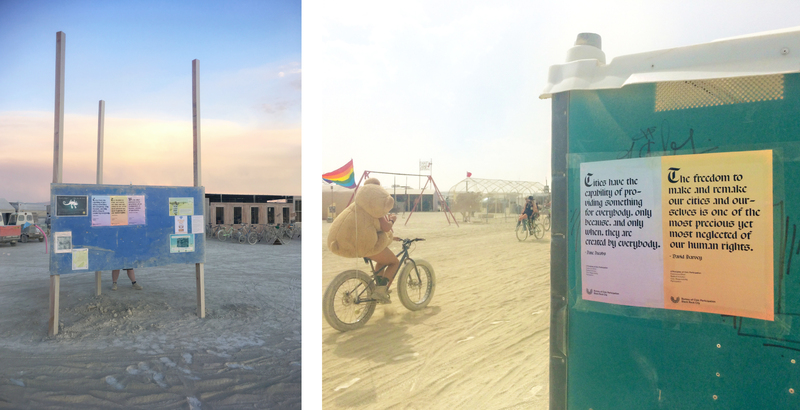 Black Rock City is an experimental city raised from the dust of the Nevada desert for one week every year during Burning Man. 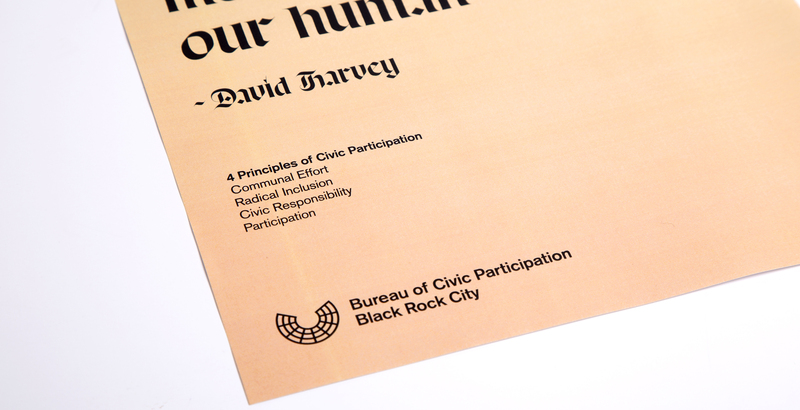 To encourage active participation in the city, we contributed posters from the fictional Bureau of Civic Participation, reminding citizens of the key principles of the city and inspiring them to take agency over the collective experience.